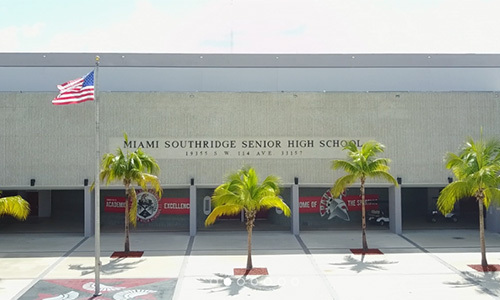 Miami Southridge is known for its rich traditions established over the past twenty-nine years. Our goal is to continue our great traditions as we plunge forward with commitment to excel in excellence in academics, athletics and community. The staff and faculty are second to none. I am very proud of the many school related and personal accomplishments they have achieved. This year we had six teachers to receive their National Board Certification. Not only have our teachers reached new heights, but our students as well. Our academies and honors programs have encouraged our students to go beyond the required minimum and prepare them for future careers. Several students have received awards for earning over 1,000 hours in community service on an individual basis. We are the only school chosen by the College Board to be an AP Laureate school. We are more than a school; we are a "family". Therefore, we want to invite each and every one of you, parents and community persons alike, to become a permanent part of the "Spartan Family".